What does greatness mean to you? I bet each of us would answer that question differently. Primary Greatness is by the late, great Stephen R. Covey. This book is a collection of some of Dr. Covey’s essays and articles that aren’t as well known and haven’t appeared in book form until now. 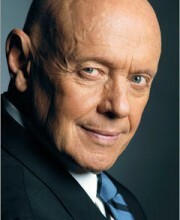 For those of you who don’t know, Dr. Stephen R. Covey (October 24, 1932 – July 16, 2012) was an educator, author and organizational consultant. He is best known for authoring one of the most popular business books ever written, The 7 Habits of Highly Effective People. Covey founded the Covey Leadership Center in 1985 which is now FranklinCovey – one of the world’s leading organizations on leadership and performance improvement. Dr. Covey believed that there are two ways to live your life. Live a life of Primary Greatness, which is a life of integrity, responsibility, and contribution. The other way is to live a life of Secondary Greatness, which focuses on popularity, money, fame, etc. Throughout the book, Covey teaches us the 12 levers of success that lead to a life of Primary Greatness. They are integrity, contribution, priority, sacrifice, service, responsibility, loyalty, reciprocity, diversity, learning, teaching and renewal. Dr. Covey’s work has impacted millions of people across the world and I expect that number will continue to grow with his newest masterpiece. Enjoy learning a new framework and set of rules for achieving a fulfilling life of greatness. "Character, what you are, is ultimately more important than competence, what you can do." Covey’s explanation and distinction of Primary Greatness vs. Secondary Greatness really pushed me to examine myself and my motives. To further explain each, Primary Greatness is on the inside. It’s our character and who we truly are as people. Primary Greatness is the kind of success that comes from the contribution we make in our lives. Ultimately, who we are and how we act starts with our character and everything else that we do is built off of that. Secondary Greatness focuses on more material and superficial things. Examples might be, popularity, title, position, fame, fortune, honors, etc. Since Primary Greatness is based on our character, those core principles act as our guiding compass. No matter what we face throughout our lives, our decisions should leverage those principles in order to guide our decisions. "The secret life is where your heart is, where your real motives are – the ultimate desires of your life." Public Life is seen and heard by our colleagues, associates and others within our circle. Private Life is where we interact more intimately with spouses, family members and close friends. Secret Life is where your heart is, where your real motives lie. It’s the source of your Primary Greatness. Everything in our life flows from our personal motivations and if we don’t get clear on what those are, we won’t fully live a life that is true to ourselves and our potential. "If we believe secondary greatness is better than primary greatness, we have no hope of achieving primary greatness." “The key to primary greatness is to be centered on principles,” writes Dr. Covey. But why? Dr. Covey does a great job of explaining this concept throughout the book. Essentially it’s because principles never change. They are timeless and universal and don’t change generation to generation. For example, having integrity is a principle. Integrity is deep honesty and truthfulness and in a sense “walking your talk”. Integrity is always going to be important, no matter what changes in our world. We’re all influenced today by many things. TV, media, social networks, music, etc. All of these can impact your choices, decisions, and views of the world in a good way or a bad way. It happens to us all. When this happens though, we need a way to stay grounded and true to who we are, and living based on your principles is a way to do that. It amazes me that Dr. Covey continues to impact and inspire the world even after his passing. Primary Greatness is a book that will, if nothing else, make you pause, think and examine your own motives. I’m sure you already feel you lead a great life and most of us do (or at least we try to). Dr. Covey says “there is something in us that is always calling us to be greater and better than we are.” We can all be better and do better and if we live our lives striving to attain Primary Greatness, and at the end of our life, we’ll have done more good than we could have ever hoped. I think we can all agree that our society needs that.